It was some time after Babangida’s bloodless coup when most imports were still banned or at least strictly controlled that we received a smuggled shipment of cookies. Imports generally meant anything white people would want to use. White rice, white flour and white sugar were on the top of the controlled list. The military dictator’s reasoning was that black people did not use or need to use white people’s stuff. In fact, the reasoning was sound, but it had nothing to do with blacks or whites. It had to do with basic economics. 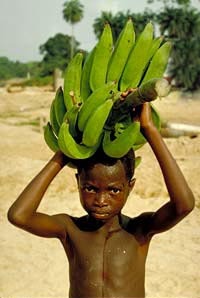 Before the oil boom, Nigeria was self sufficient in agricultural production and, in fact, exported enough home grown produce to have a surplus budget. In other words, they made enough money on rice and millet and chickens and palm oil to buy refrigerators and tires and aircraft spare parts. World trade was working to the national benefit. After the oil boom got into full swing the entire economy stopped producing marginally profitable potatoes, tomatoes and fattened goats and went to work in the oil fields. If you are not producing, however, you are importing and very quickly the Nigerians turned into a nation of importers. They began to import chocolate bars, cookies, coffee, toffee, toothpaste, limousines, Palmolive soap, toasters, kettles, umbrellas, and a myriad variety of other wise non-essential goods. Worse yet, despite the wealth of in-country natural resources, the Nigerians found it was easier to take their newfound oil cash and buy essential items that could have been mined or refined or otherwise procured locally: such as coal, leather, lumber, plywood, concrete, lime, rubber, copper wire, hops, barley, wheat, and refined petroleum. Here was an oil producing country that produced far more oil than they could consume wanting to import petroleum. At any one time, the Lagos’ Tin-Can Port could have anywhere from 200-400 ships lined up waiting to unload their cargo. Babangida’s bloodless coup and the following import bans were to stop this economic suicide. For me, however, it meant having to bring in a suitcase full of Ivory soap, Crest toothpaste, Scholl’s foot powder, Right Guard deodorant, Bic razors, Head & Shoulders shampoo, and several packages of my favorite Wrigley’s Juicy Fruit chewing gum. Sometimes I would even bring in a couple of Coffee Crisp chocolate bars, but they would often melt and get sticky so I usually avoided them. The suitcase represented a six-month supply, as that was how long my in-country work contract would last. Getting the banned goods past customs was not a problem as long as you carried a couple of American dollars in your shirt pocket and slid it into the right palm at the appointed time. “Thank-you Captain, you are welcome, you may go.” Everyone was happy and I got my goods intact. 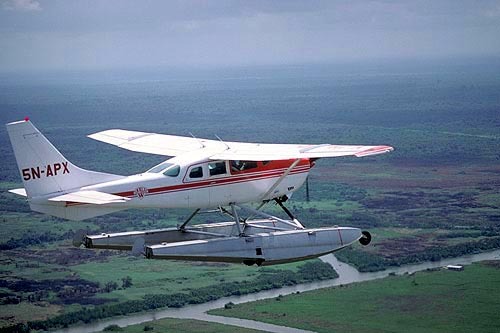 I was working for the American pipeline and dredging company Willbros Nigeria, flying their C206 amphib into the Niger River Delta. The delta was, at the time, where the oil exploration and development was concentrated. It was a perfect place to operate a floatplane as the delta was made up of thousands of rivers running north to south with all the oil workers needing to travel east to west. Going by boat meant going north up one river and south down the other to traverse westward. With the floatplane I could fly in a straight line and land anywhere in the delta. Helicopters were still not an option, as it would take from 2 to 3 years after a wildcat field was drilled and capped before a production platform with the corresponding helipad would be placed on the well. One day, after dropping dredging engineers at a new work site, I anchored on a Niger River tributary south of Nembe Creek. The villagers here were not familiar with the aircraft and let me be. Most were wary of the juju or magic of the mysterious flying canoe, giving the floatplane and me a wide berth. As they paddled with the outgoing flow of the river, they would unabashedly glare at me as if to avert any bad spirits that might steal their way. Undoubtedly they had heard stories around the evening fire told by the braver ones who had ventured to visit with white men. The day was calm and the fast flowing water shone with the reflection of foliage and sky and clouds mixing like a translucent vortex of green blue and white paint swirled in a gallon can. The rain forest proximity was so powerful that I sat motionless on the steps of the floats mesmerized by the intense presence of it all: the chlorophyll fragrance of the oxygen saturated air, the dry mahogany heat of the mellow sun, the connective tissue of fallen leaves and red mud crabs, the belly splash of a transparent chameleon startled from above, the popping of bubbles blown by emerging mud skippers, the clear air tune of a malachite kingfisher wired directly to my eardrum like a taunt stainless steel line, and the beckoning of the forest filtered water as if a delta maiden were taking my hand and leading me to the river bed. All this surrounded me as I sat and wondered what a Canadian boy from the prairie was doing here. I was going to be on anchor for hours waiting for my passenger so I had brought a lunch. I could not leave the floatplane unattended in case the tide turned or a storm passed and pulled the anchor. I had previously lost the plane downstream several times, and did not want a repeat performance. So I stayed on watch. I was particularly looking forward to my lunch today, however, as I had brought a treat. Today, however, I had a fresh bag of Dare’s Chocolate Chip cookies. As I had been in country and cookie-less for the past 6 months, this was going to be a treat beyond compare. Moreover, since I was alone in the forest I did not have to share. I usually have no problem with sharing, but hogging the Dare’s cookies was a hold over from my days as a ten-year-old boy with two greedy sisters. They never had to share, but because they were girls they could get away with murder. I had to share or I was beaten. My mom denies it, but at least that is the way I remember it. After slowly eating my canned ham and cheese sandwich, (of course the bread was made with illegally smuggled white flour,) I waited as long as possible to open my bag of cookies. When I did the oven-baked aroma of flour and baking powder and sugar and vanilla, and of course chocolate weaken my resolve to wait any longer and I helped myself. Many cookies and a cup of thermos coffee later I was satiated. Only then did I look out and see a lone dugout canoe paddling silently past. I never thought for a second and waved them over. Paddling in the front of the canoe was a delta women dressed in native wrapper. She was sun weathered and dark as ebony with the only protection from the sun being a smaller wrapper bundled on her head. Paddling with obviously less enthusiasm in the rear was a head bare old man wearing only a dirty worn cloth wrapped around his loins. I never really thought they would answer my beaconing. The old woman was definitely hesitant. She curtly exchanged words with the old man, but his terse reply was final. They paddled cautiously over to the floatplane. I moved slowly as not to startle them. Villagers were easily startled and for good reason. Tribal wars were common. Although they knew I was neutral, they might not know I was safe. As they pulled along side I could see that their faces were almost black red from the exposure of working out in the sun. The hand hewn dugout canoe was full with clusters of bright red palm oil kernels freshly cut from the palm trees. The smell of the fruits was sour and aromatic at the same time. I signed an offer of a bottle of water. I knew that offer would be taken, as fresh clean water is scarce. The old man signed for me to hand it to the old woman. She fumbled the water bottle and was initially stumped by the tamper proof seal. The old man smiled at me. I left the cap on purposely to show them the bottle was new and not refilled. That made it more valuable. Just when I was going to relieve her of her anguish she beat the system and popped the top. She helped herself with a long pour straight down her throat without touching the bottle to her lips. She smiled her first smile and passed the sweet water to the old man. My next offer was a bit more difficult. I wanted the experience of introducing these native villagers to the joys of cookies. That was to be a privilege they would not understand, as they would have no idea of how scarce these special cookies really were. Only I would enjoy the irony of offering something so privileged to someone who would certainly not appreciate the gesture. The irony was as sweet as a cookie. The sweetness more than anything was going to be an obstacle to this offer being accepted. After all, if they did not accept the moment would be lost. Nigerians, as a rule, do not like sweet. After centuries of adaptation they have learned to love salt. Sugar, however, was simply not in their taste repertoire. Sweetness was bitterness to them and bitterness to them was sweetness to us. The result was perfectly white teeth; weak from lack of calcium, but beautifully white. To offer a sweet to a Nigerian was normally like offering cod-liver oil to a child. In this case, however, I counted on that for the brief moment of biting into the cookie, the very moment of contract between the giver and the accepter, where trust is given and the guard is down, they will not know the cookie is sweet. If you have never known a cookie how would you know it is sweet? I was concerned that this was going to be a breach of trust, but the moment was too fleeting to miss over a slight, and inconsequential, impropriety of conduct. I felt like a National Geographic Explorer. I was about to cross landscapes never trodden on before by fellow cookie bringers. To watch a native eat his or her first cookie was simply unexplored territory too irresistible to deny. I bought down the bag of Dare Chocolate Chip Cookies and reached in for one. I raised the cookie to my mouth and took a self-assured bite. I chewed deliberately, without attempting to influence the old couple with any “Umms or Auuhs,” or smacking of my lips. I simply chewed. And then, with great anticipation, presented the open bag to the old man. He smiled and wiped his soiled hands on his soiled loincloth. I could tell he was interested. He was about to bite if you excuse the pun. He reached in and almost daintily pulled out a single cookie. He then nodded toward the old woman and I nodded approval for him to extract a second cookie for his partner. Nearby, an African Fishing Eagle circled cautiously overhead and a pied kingfisher let out a cry and darted beak first into the swirling waters. The sun was relentless and the old man was beaded in glistening sweat. No doubt the sweet water was now cooling his baked skin as he gingerly placed the cookie near his mouth. Then stopped. A great gray heron speared a fish and flipped it head side down to slide it into its open throat. The old man sniffed the cookie and a peculiar shine wiped across his face like the sun breaking from behind a cloud. The old woman watched in trepidation as the old man lovingly fondled the cookie. The man shifted the cookie to his fingertips with what almost seemed like anticipation. Finally he scoffed a large satisfying bite and chewed the cookie. I could see that he was feeling the texture of every swish of the tongue and extracting the flavors of every morsel. He was enjoying the experience as if he was a ten year old boy being transported back in time to the dark security of the closet, hidden away from his sisters and enjoying his own chocolate chip cookie. I was overwhelmed by his response. This old man in his dirty loincloth, this fetcher of palm oil nuts, this king of the rainforest, licked his fingers and sighed a heavy sigh. I took another cookie from the bag and stared at it. I looked up from my cookie and glanced around, wondering where the voice had come from. From one hundred feet above the forest canopy the African Fishing Eagle made his dive into the delta waters clasping the gasping red snapper in his talons and flying away to home.